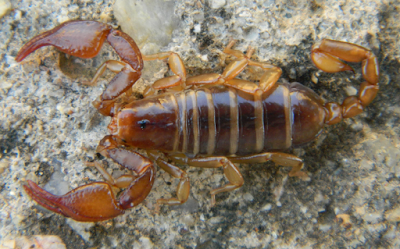 Ersen Yagmur and Gioele Tropea have recently published a new species of Euscorpius Thorell, 1876 (Euscorpiidae) from the Balıkesir and Çanakkale provinces in northwestern Turkey. Euscorpius idaeus sp. n. is described from Balıkesir and Çanakkale provinces, from northwestern Turkey, based on morphological evidences. This description raises to 18 the Euscorpius species currently recognized in Turkey. Yagmur EA, Tropea G. A new species of Euscorpius Thorell, 1876 from Mountain Kazdağı in northwestern Turkey (Scorpiones: Euscorpiidae). Arachnida - Rivista Aracnologica Italiana. 2017;3(15):2-17. Thanks to Ersen Yagmur for sending me their article!